A year ago I would never have believed that such a simple, fast and inexpensive procedure would change the way I look and feel so dramatically. I recently visited my lovely and very talented beauty therapist, Jo at Jojo’s Home Beauty to get my eye brows waxed and tinted and my eyelashes tinted. I love getting this done as it’s (almost) pain-free and so quick and easy with quite dramatic effects. Do you get your eyelashes tinted? Or your eyebrows waxed or tinted? What are your thoughts? ps. I have written about Jojo before – here. She’s the best! Yes I’ve tried this too…it’s not overly easy to use with a two year old running around our feet!! Yes I’ve had both done. Absolutely loved the eyebrow tint. Took a bit of getting used to the first day or so as it really makes your eyebrows stand out, but loved it. Unfortunately I was born with short, thin, dark eyelashes. When I had them tinted they didn’t look any different at all! In fact, mascara doesn’t even do much for my eyes! Hence the reason why I decided to jump in and try eyelash extensions about a month or so ago. Now, before I go on about how much I adore my new eyelashes, I’d like to warn you and everyone else of the dangers of BAD extensions. The first lot I had were hideous and I looked like a china doll/drag queen. 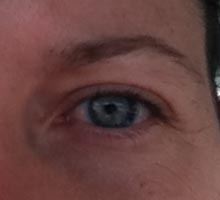 I promptly had them removed and found a new place who have mastered exactly how I want my eyes to look. They are amazing! No mascara, very rarely wear eyeliner. They are great and I thoroughly recommend them to anyone with zero lashes! You are lucky to have lovely long lashes that you can tint and they look amazing! And they are beautiful on you!! Never turn back!! I love getting my eyebrows and eyelashes tinted! Being so blonde you can’t see my eyebrows or lashes so it makes a huge difference to me and it makes me feel so good within myslef and for some strage reason makes me feel clean! Not that I don’t shower or wash or anything!! 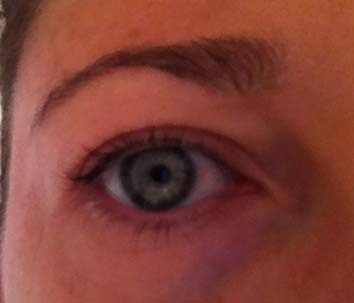 I also had eyebrow threading done the other day as well, really defines your eyebrows. I too have tried eyelash extensions but I hated them! I have had them done by two different places and found them very irritating, however my mum had them on for years and loved them. I will agree with you that the first lot I had were uncomfortable. They were too long, thick and heavy. The ones I have now are light and feathery. Don’t notice them at all! Ted tries to swipe at them. Funny boy! Really? That comment about showering is funny!! Love it! !